Have a light-bulb moment every day when you open Taste of Home Kitchen Hacks. 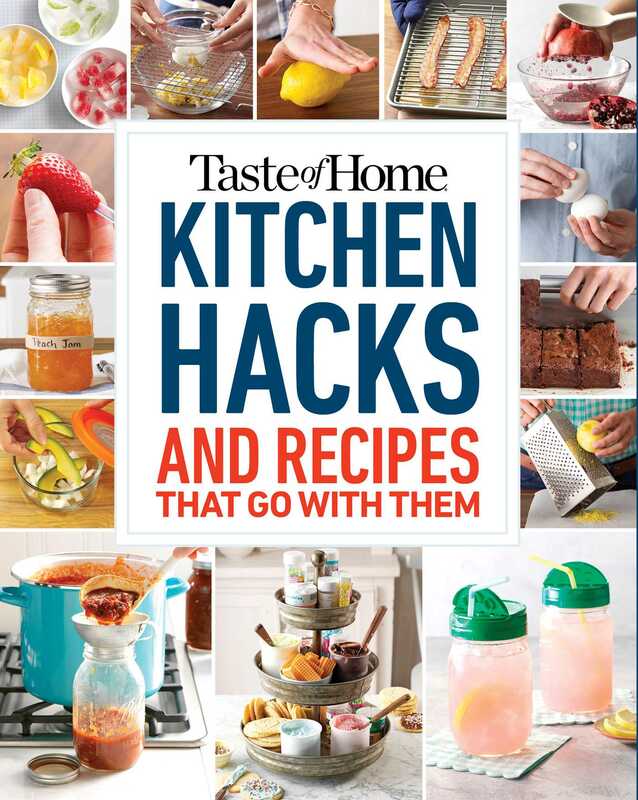 100 hints, tips and hacks plus 100 recipes that put those hacks in action are all contained in Taste of Home Kitchen Hacks. With Taste of Home Kitchen Hacks you’ll learn how to chop six hardboiled eggs at once, cool pans of cookies quicker than ever before, hull strawberries without sticky fingers and slice a dozen cherry tomatoes instantly. Take advantage of these timesaving hacks, then cook up the recipes that go with them. That’s right! You’ll find 100 recipes that take advantage of the mind-blowing tricks, tips and hacks in his unique kitchen helper. Step-by-step photos, new uses for old kitchen gadgets, simple ingredient substitutions and even kitchen-cleaning secrets make Taste of Home Kitchen Hacks one sensational guide you can’t do without.